The Co-operative and Greggs have announced new retail outlets in Porthcawl. The Co-operative has agreed a 15 year lease for £80,000 for a 4,000 sq ft unit, while Greggs has agreed a ten year lease for £20,000 for a 973 sq ft store. Both retailers will be based on the ground floor of a 30,000 sq ft development located on New Road, Porthcawl, at the entrance to one of Europe’s biggest caravan parks – Trecco Bay. The Co-operative opened Friday 4th December, creating 23 jobs, and Greggs has also started trading, creating eight new jobs. 40 residential units are also being developed on the upper floor and to the rear of the property for Wales and West Housing Association. Leisure and retail property specialist EJ Hales acted on purchasing the site on behalf of South-Wales based Jehu Group and subsequently agreed terms with Greggs and The Co-operative. Matthew Morgan, partner at EJ Hales, said: “It’s great to see these sites now having a new lease of life and creating employment opportunities for local people. Jehu Group chose the perfect location for the development as Trecco Bay has become a hugely popular site with both the local residents and tourists following its re-development. “There is also limited competition in the area, which helped create a highly competitive bidding process amongst perspective tenants. 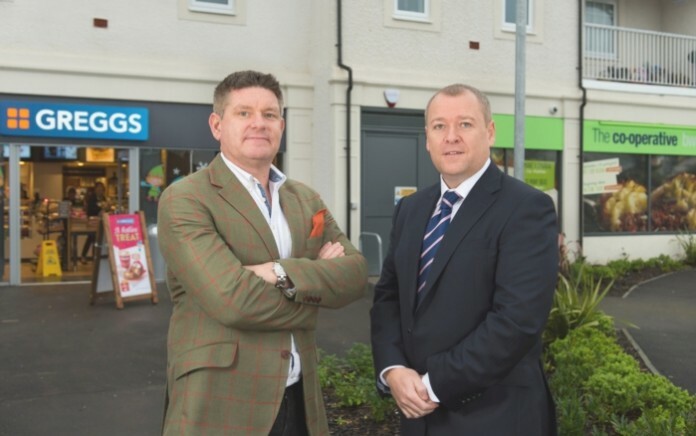 Simon Jehu of Jehu Group, said: “We’re delighted to have secured the Co-operative and Greggs for our new development. “New Road is the perfect location for both stores and it is an exciting time for the town as it will be undergoing further development in the near future. “We’re also delighted to provide Wales and West Housing Association with 40 residential units. The total value of the development was in the region of £5.5m representing significant investment and creating more than £15m of economic activity. “We’d like to thank EJ Hales, who we have worked with us on several projects in the past, for their expertise and efforts in securing the positive long-term leases. EJ Hales has been at the forefront of the South Wales commercial property market for over 80 years. It has built an enviable reputation within the retail and leisure commercial property marketplace. In the last year the company has advised on a number of high profile deals spanning the breadth of the country for clients including Tesco, Specsavers, Argos, Next and Subway. Jehu Group of Companies has a heritage of creating quality projects in the property industry spanning more than 80 years. Group clients include Tesco, Whitbread, Travelodge, ASDA, British Airways, McDonalds, Halfords, KFC and Royal Mail.